One line disclaimer: I’m not a doctor of any kind. Don’t do anything stupid. It is recommended that you do any cleanse or extreme diet under doctor supervision. Ok, there. Today’s a good today. I just completed a 21-day cleanse! That’s 21 days of eating nothing but fruits, veggies, chicken, fish, brown rice and lentils. I’ve lost around 7 lbs, at least an inch from my middle (maybe more… all my pants feel looser and I even fit into some old jeans that were too tight) and I feel pretty great. Today I can eat whatever I want and the crazy thing is… I’ll probably keep eating that same way. Trust me, I’m more shocked than any of you. Being out in the world today DOES effect our body no matter how hard you try to avoid it. Things in the air, the ground, in our shampoos and soaps, the junk they spray on your fruits and veggies… all of that is in your body. The foods you eat — even the good foods — can be affecting your body. You might have intolerances to the foods you eat every day. How do you find out? By cutting everything out, cleaning your system and, later, adding them in one by one. Basically, when you cleanse your body, it’s like pushing a re-start button for all your insides. If you get sleepy mid-day, have trouble catching your zzz’s at night, have infertility struggles or just want to have a healthy baby (do NOT cleanse if you are already prego or nursing… that baby needs all the nutrients it can get), can’t lose weight no matter how hard you try, have that constant foggy head, crave certain foods all the time (for me it was cheese and bread) or just want to do something good for your body, this is for you. Still following? What you really wanna know is what does it mean to do a 21-day cleanse. What in the WORLD do you get to eat? Fruits. Veggies. Lentils. Brown rice. Oils (selected like olive or coconut). Spices (the lifesavers). And later… chicken and fish. All organic. All fresh or frozen. That means nothing pre-made or pre-packaged with the one exception of canned tomatoes. Honestly, before I started I wasn’t sure I was gonna be able to do this. I mean, we eat pretty healthy at home with a couple vegetarian dinners a week, but NEVER a full day of just veggies and fruit. I was gonna miss my cheese (I have had a small addiction to cheese), I loved bread and ate as much as possible, and even some of the vegan recipes I looked up were off limits (they had things like beans, nuts and quinoa in them… no go for the cleanse). On top of that, I was going to be cleansing on Cinco De Mayo (no chips or ritas for me. *sigh*), at a baby shower (hello all the foods I love in one place!) and a mother’s day lunch where a chocolate fountain tested my willpower. The first ten days you can only eat fruits and veggies with half a cup of brown rice OR 1 cup of lentils a day. After the ten days you can add in fish and chicken, which I happily did. The cleanse also includes supplements which you have to take in order for this whole thing to really do it’s job. That’s 21 cleanse pills a day for the first 8 days (if I can do it, you can do it. I have a pill swallowing phobia thanks to my cartoon sized tonsils) and then 10 green pills a day after that. You can buy them from Standard Process or save a little money and get them off of Amazon instead. So how did I do it? I had a plan, I always had snacks on me and I made delicious recipes. Sounds easy? That’s cause it is! Don’t try to survive 21 days on just salads… you’ll go crazy. Instead, get creative! Each day started our with a smoothie… that wasn’t anything totally new for me. The catch, though, was that I couldn’t add any fruit juice unless I squeezed it myself and I had to added a couple of scoops of their SP Complete Powder and a scoop of fiber power, both of which take away much of the sweetness of the smoothie. The first day was rough, but after that you get used to it. Strawberries, bananas and pineapple are your friends — they will keep your smoothies tasting less like dirt and more delish. You can add whatever fruit you want to your smoothies, and I ALWAYS add a large handful of spinach or kale to each smoothie. I promise you won’t taste it. You know when your mom said that and she was lying? This isn’t like that… you just won’t be able to taste it. Bonus points for getting some veggies in for breakfast! Amazingly, the smoothies can hold you over until lunchtime! I swear there is something magical in that powder (aka protein and other good stuff that keeps you full). You have to have 2-3 smoothies a day so I typically had smoothie #2 either for lunch or an afternoon snack. 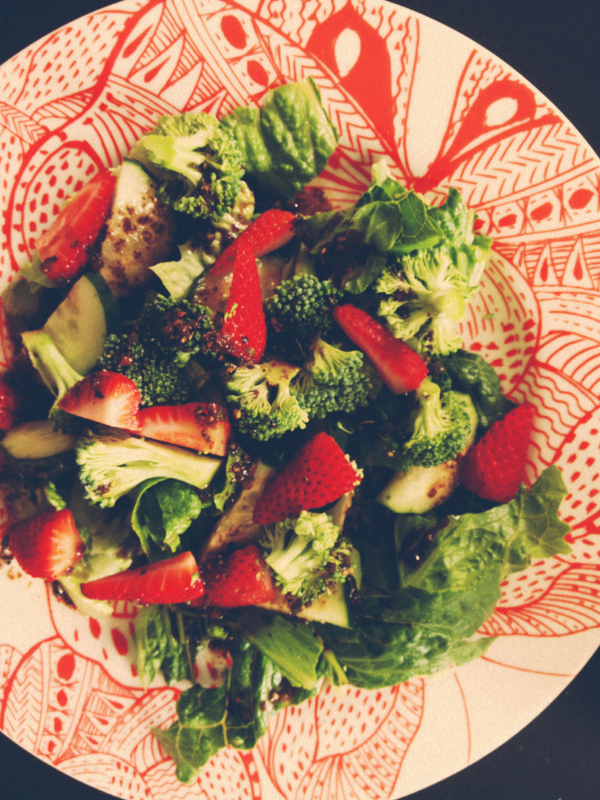 A typical lunch would be something like sauteed veggies and a salad or roasted brussel sprouts and apples. The rule is to take in twice as many veggies as fruits and as little carbs as possible (avoid rice if weight loss is your goal). Oh, and no store-bought salad dressings! Learn how to make your own vinegarette! They taste so much better than homemade. My favorite recipe is here. If I needed a snack I had things like carrots and celery with homemade guacamole or baked sweet potato fries. If I craved something sweet, I ate a date (just eat one or two though… thoses little fruits are still packed with sugar!). Dinnertime consisted of meals like lentil soup (this will become a household staple. ), giant salads, wild rice and veggie stuffed mushrooms, homemade spaghetti sauce over zucchini and fajita veggies over brown mexican rice topped with avocado and salsa. Once I added in chicken and fish, I felt like I had a whole world of options! Eating roasting chicken with a salad is pretty normal at our home, but I was excited to make other things like spicy tilapia with a mango avocado salsa and grilled kabobs. Doesn’t sound so bad, right? I felt surprisingly good! Really good! I anticipated feeling hungry, grumpy and having crazy cravings. I didn’t experience any of that. If I was hungry, I ate something. Did I have any of those cleanse side effects like headaches, flu-symptoms, etc.? Thankfully, I didn’t drink much coffee before the cleanse so I didn’t have the awful caffeine withdraw headaches that many people get. I did, however, get a nasty migraine day 3, but it was short-lived and went away without my usual remedy of caffeine. After that I was totally fine! It is totally normal to feel some sort of sign of your body cleansing such a chills, headaches or just a plain sick feeling. It won’t last… it just means it’s working! Weird, huh? Can you work out while on the cleanse? For the first week, you are supposed to only be walking at least 4 days a week. Honestly, I got bored with walking after about 5 days and went to my favorite boxing class. My teacher told me not to sprint since I was cleansing, but everything else felt fine. Once I added animal proteins back in I felt like I could do any activity I wanted and feel strong and normal. I think I even had MORE energy! I had read that most people on this cleanse lose 10-15 lbs. I lost almost 7. I’ll admit, I was a little disappointed by this, but I know that losing 1-2 lbs a week is a NORMAL weight loss. I anticipate I’ll lose the final few lbs over the next few weeks. I didn’t let myself step on the scale more than once a week… the weight will eventually fall off, but the main point is to clean your body. What about the rest of my family? What if they aren’t cleansing? J didn’t do this cleanse with me and it was fine. He’d just cook up a side of chicken with whatever veggies I was cooking up when I couldn’t have chicken yet or would make a grilled cheese sandwich to eat with the veggie soup. Thankfully, this meant I didn’t have to cook separate meals. Honestly, once I was eating chicken or fish we ate the same things for dinner at night. Everyone loves kabobs or turkey spaghetti (just eat yours over mushrooms or zucchini instead of pasta)! This is one of the things I was most worried about. I have little to no will-power when it comes to things like sweets and cheeses. Amazingly, the cleansing actually “cleanses” you of cravings! It’s SO weird. I didn’t crave sugar, carbs, cheese, caffine, chocolate or anything else I couldn’t have. That isn’t to say I didn’t WANT them. Sitting at a Mexican restaurant with chips in front on me was tempting. I WANTED the chips, but I didn’t crave them. It’s like my mind wants what it likes but my body doesn’t need it. Does that make any sense? I am still amazed at all the treats waved in front of my face that I didn’t eat… and didn’t have a hard time skipping out on. Shockingly, only once. After the mother’s day chocolate fountain incident (incident in that I was near a chocolate fountain and didn’t even taste it) I allowed myself one dark chocolate square. That was it. I felt so strong and didn’t want to mess up the body cleaning process. I’m supposed to slowly introduce foods back into my diet, one at a time. The purpose is to find out how my body reacts to foods. I could have a food intolerance and not even know it (like dairy making me feel sickly or grains making me feel bloated… things like that). I am now used to eating all these fruits and veggies so hopefully that won’t change too much. And while I am glad to not have to down 2 smoothies a day, I still started my day with a smoothie this morning, only this time with a piece of whole-wheat toast on the side. I don’t have any plans to cut out any specific foods, but I do hope I continue a mostly whole food (as in foods that aren’t processed and are living) diet. Any other questions? Just ask! I’m really proud of myself for seeing this through. I really do feel SO good! Stay strong! It just gets easier. Some food ideas… fajitas minus the tortilla and cheese. You can even make homemade mexican brown rice. Yum! Lentil soup….veggie and rice stuffed mushrooms…balsamic roasted brussel sprouts. When I craved sweets I cooked some apple slices in the oven with cinnamon and diced dates. So good! Hi Alexis – I was very happy to find your blog and read it prior to starting the cleanse. I have just completed my 7th day and was told by my chiropractor that I am eating WAY too much fruit. Suggestions for trying to curb my sugar craving? Fruit has been the saving grace since it makes me feel that I am not being deprived of my typical go-to sugary, comfort foods. Learn to love those veggies more? For me it helped to find veggies and prepare them in a way that was satisfying. For example, I’d marinate zucchini and and peppers in a tiny bit of oil, vinegar and garlic and grill them. Or stuff mushrooms with brown rice. Or roast sweet potato wedges. Have you tried my lentil soup recipe? It’s super hearty and delicious…you won’t miss the fruit for that meal. Good luck! I was just looking for some insperation to keep going with this… I am on day 4 and have the worst headache ever… I even left work early. I had an extra big bowl of rice as everyone I talked to thinks it’s card withdrawal. Didn’t help, but your post is very encouraging! Please post the recipie for lentil soup! I would love to try it! You can do it! I got an awful migraine around day 3 or 4. Just keeping drinking LOTS of water and don’t let yourself get hungry. Remember that you can snack as much as you need to as long as it fits within the cleanse. I’ll try to post that lentil soup recipe this week if I can find it. Getting ready to start SP Cleanse with my chiropractor and a group. I am very nervous about doing it because of the potential side effects. I have never done a cleanse before. Thanks for your inspiration and helpful tips to get through this. I totally understand. I was so afraid that I’d feel awful on the cleanse, then pleasantly surprised that not only did I not feel crappy but I felt great! Like I said in the post, just make sure you keep eating and drinking water. You don’t want to get low blood sugar and the water helps flush out your system. I had a hard time with the pills (they made me gag) so I took them with some watered down UNFILTERED apple juice, which helped a lot. Best! I’m on Day 11 of the SP cleanse and feeling GREAT! Looking for your lentil soup recipe. Is it here and I just missed it??? Here is the link to the recipe: https://vivagood.wordpress.com/2012/10/22/winter-lentil-soup/ I hope you like it! Sometimes I have to add a bit more cumin to get it more flavorful, but this is a go-to soup for us, even when we aren’t cleansing. I’m on day 3 of the SP Cleanse, and so far, so good. No crazy cravings, though I have been very, very hungry in the late afternoon, early evening. My body *might* be missing protein. Could be. Make sure to eat lots of snacks when you’re hungry! I found that I did better making a true lunch (sauteed veggies or a salad) and then having a smoothie for an afternoon snack. I think I did sweet potato fries as a snack a few times (baked of course). Keep it up! Good Post! I am on day 7 of the cleanse. day 1 and 2 were pretty easy but days 3-5 were awful. The headache cleared up on day 6 :). But even with the headache I felt awake and alert and full of energy. The lentil soup has been a saver for me. It delicious but also feels “meaty” so its more satisfying (mentally) than a salad. I have been making portobello mushrooms and chipotle sweet potato lettuce wraps topped with avocado.. totally delicious. after week one, my pants are a little looser on the waist. My worst craving is chocolate and cheese.. I want to eat a whole block of cheese straight out of the wrapper. 🙂 Thanks for the inspiration to keep going! I am on Day 6 and feeling great. Day 3 was rough but it was because I went too long in the afternoon without eating. I am down 7lbs. YAY! I have been trying to get the scale to budge for over 6 months now. I do best when I am eating a little something every 2-3 hours. My lifesaver at work is cut up carrots, celery, bell peppers and cucumber that I dip in my homemade guacamole, which I make with a fresh avocado, little bit of salsa and about 1/4cup cooked red lentils. I blend them together and it is delicious. I have the lentil soup cooking in the crockpot today for dinner tonight. Hoping it tastes good. My Chiroprator is wanting me to do the SP cleanse. I am afraid that I will get sick and won’t be able to handle it. She then said to only do it for eleven days!! So up in the air about doing it. You can do it! The best way to make it through the beginning days is to PLAN! Plan out all your meals and always have snacks on hand so that you don’t get hungry ever. If you feel really sick (and not everyone feels sick on this… all I got was a short-lived migraine one day) try adding an egg into your daily diet. Some people find that just eating one egg makes all the difference. But I think you can succeed in this! And if you don’t overthink it, the food is easy… lots of salads, make some lentil soup, roast up some veggies and serve them with rice… there are so many options out there! My biggest concern is getting sick. I’ve gotten colonics and one of them really did me in and I stopped doing them. I am very sensitive and my nervous system becomes affected. My Chiroprator, after telling her my symptoms tells me I need to clean out my liver and every test shows its not working at its highest potential. I currently am a healthy eater…don’t do coffee, alcohol, white flours or sugars. Eat a lot of salads and fruits and chicken. So I’m hoping maybe it won’t be as bad as I’m making it out to be. I think I’m over thinking it too much. You mention to eat an egg. Do you mean an egg a day while your on it? Sounds like you should be fine! I don’t know that a cleanse like this is as harsh as colonics, but I’m not a doctor. Yes, I meant eat an egg a day if you feel like you need it — just make sure it’s organic and free range. I didn’t ever find that I needed to — lentils and spinach seemed to give me enough energy and protein — but some friends find that eating just one egg helps them feel a ton better on the cleanse. I just finished the Standard Process Purification Process a couple weeks ago. I did it with a group at my chiropractor. I had never done one before and I was very concerned about being sick also. I did give up coffee a week before I started and I did not get any withdraw headaches. I had a couple days that I felt weak, but not sick. I am down 14lbs and I feel great. I have continued to eat pretty much just the same as I was when I was doing the detox. I have added a little dairy, but I am staying away from breads/pastas/sweets because I know those are triggers for me. Good luck! Sounds like you did good on your sp cleanse. I’m hoping to do the same! Guess I’m fearful of the unknown!! What spices and herbs can be used during the sp cleanse? As far as I know, any herbs and spices are ok! Try to stay organic as much as possible and avoid using salt if you can (just a dash is ok…but not much more than that). I think the cleanse is SO much more easy to handle when you add in garlic, basil, cumin, curry powder, oregano, etc. I also used a tiny bit of oil and vinegar with my herbs to make salad dressings and marinades. Remember though… sugar isn’t an herb or spice. Neither is honey in this case. 🙂 Also, be careful with store-bought seasoning blends as many of them have nasty extras like msg and high fructose corn syrup. Ick. As always, talk to your chiropractor or doctor for a professional opinion. Thank you for your inspiration. I will be starting the cleanse next week. Should be interesting. Thanks for all this info. I have three days to go on the cleanse. My main reason for doing this was just to get my system cleaned out. I believe that I am the queen of constipation and if this helps with that it will be well worth the 21 days. I started out on the Gastro fiber capsules then found out that they had psyllium in them. That was awful. No BM for the first 7 days. they then put me on the whole food fiber and things changed. The weight loss is a bonus. Haven’t been on scale for almost a week but during the first two weeks I had lost 5.6 pounds. I feel great, and sleeping 7 hours a night. I have a juicer and when I get tire of the veggies I juice. Thanks again for the info. Have a blessed day. I’m on the SP Cleanse now. I found your site hoping to get some inspiration to keep on keeping on. THANKS!! Good feedback here. I’m on day 9, which means i can add Protein tomorrow. I’m so excited i could cry. It’s gonna give me the push in need to make it to the end. I have always eaten ‘healthy’ but do have food addictions (breads, cereals, cheese). I feel like I will be able to better avoid giving into those things after I complete the cleanse. I didn’t have many side effects (headache, etc…), but I did loose weight which i’m not happy about, and my energy is generally low. Protein tomorrow is gonna change all that. Then it’s onward and upward. To anyone doing this, you gotta believe in the process and keep on going…good luck. Thanks for your post. I have 9 days to go and truthfully can’t believe I made it this far. The last few days have been tough. I’m really missing carbs and cheese, but I know I can do it. I’m going to try the lentil soup this week. Thanks again! I’m on day one, thanks to all of the previous posters for all your encouragement and helpful advice. I am on day 2. This is the third time I have done this cleanse but today I am puking my guts out. (sorry, graphic depiction). I have a terrible headache, which is normal for day 2, but throwing up is the pits. I can’t do the shake for lunch and missed my lunch pills… I threw up the morning ones… I feel super rotten. Ugh. You sound miserable. Stick with it if you can! Try to find some foods that are bland for your stomach. A baked sweet potato might feel ok. I am on day 9 of the cleanse and am not losing any weight. I must say, I have been using more than a “dash” of salt, but outside of that I haven’t cheated at all. Any thoughts? I didn’t see anywhere if I could have olives or not, and I have been indulging in those (the pitted ones from the olive bar at Whole Foods, so not canned). Any other thoughts on why I am not losing weight? I feel amazing, and my body feels better, but I want the scale to look better too! I feel ya, Kelley. My body was the same way, but towards the end of the cleanse I lost about 7 pounds and after the cleanse, I lost another 5-6. Keep with it! I am on day two. My question is how much of a shake should I be drinking? If I’m drinking two, is that 16 oz? That’s the only part that I’m confused about. Hi Tavia! I don’t remember the details about the shake. I remember I drank two big glasses a day — for me usually it was one for breakfast and one as an afternoon snack. I think my glasses are around 12 oz. Drinking more won’t hurt you, though. There are recipes in the back of the book for shakes. Generally, a half a banana and a half cup each of two fruits, plus the powder and as much water (I didn’t use much) as you want to make it palatable. Banana-strawberry-blueberry is my favorite. I am worried that I have had NO side effects whatsoever. Am I doing something wrong?I really haven’t felt any more tired than I usually am and I was full of toxins. I drank soda and coffee like it was going out of style and I smoked daily. I quit smoking and caffeine two days before we started so I could take advil for the headaches before I started. It worked really well! NO headaches, no withdrawal ( I realize I am only on day 5) but I don’t feel the toxins leaving my system? Is that normal? Should I expect it next week? Thanks to everyone for their posts! I feel encouraged!! I don’t think that everyone has extreme side effects. I had one migraine on the cleanse, but I get those occasionally anyways so I’m not sure if it was related to the cleanse. As long as you are following the rules of the cleanse, it’s doing good things in your body with or without side effects. Let me know what you think of the soup! My husband and I eat it regularly even when we aren’t cleansing. I also did stuffed mushrooms one night. Marinate them in some garlic, italian herbs, oil and vinegar, then stuff then with a mixture of brown rice, carrots and celery. Bake for 15 minutes or so. Yum! I have made the most amazing salad ever that I will continue to eat for a very long time. Start with mixed greens and then add diced tomatoes, celery, carrots, and red peppers. I baked some diced sweet potatoes with just a bit of olive oil and salt and pepper on them, and add those to the salad as well (let them cool). put in some avocado, and dice some mangos, top with balsamic and olive oil and voila- delicious salad. the sweet potatoes really help make it more filling. I also added a freshly broiled portabello mushroom once and it “felt” like a hearty piece of protein so maybe try that as well. Thanks so much! We will definitely try the stuffed mushrooms and the salad! Yum!! I am giving SP Cleanse serious thought. I have inflamation due to arithris. I’ve read up where doing a cleanse can help diminish pain. Anyone notice less joint aches after doing this cleanse? So I am almost into my third week of the cleanse and have not lost any weight, having the one usual BM a day and find myself in a lot of adominal pain today. I am drinking at least the 80 oz of water daily. All these veggies/fruits binding me up. Never had this issue before the cleanse. So tired I’m probably reabsorbing all those toxins. Doctor not in today. Any suggestions? Hi Donna. I’m sorry you’re not feeling well. I’m not a doctor so I’m not sure what’s going on with you. I’d definitely check in with a medical professional if you’re still feeling this way tomorrow. Perhaps consider taking a pro-biotic for your belly or some dates for fiber? As for the weight loss, I lost most of my weight after the cleanse strangely enough. It just started coming off of me. Best of luck to you! and a all round enjoyable blog (I also love the theme/design), I don’t have time to browse it all at the minute but I have book-marked it and also included your RSS feeds, so when I have time I will be back to read a lot more, Please do keep up the excellent work. Hi, My wife and I are starting the SP and we have been trying to see if we can have basalmic and apple cider vinegar. I was concerned about the basalmic vinegar because of the sugar content. What are your thoughts? Hi Justin. You know, I’m neither a doctor nor a nutritionist. I personally used balsamic vinegar in small portions as both a marinade and a salad dressing while I was on the cleanse. The sugar in the vinegar is natural, from fruit, so I considered it the same as eating fruit. Today is my last day of my sp cleanse and I have to say it was pretty rough for me on certain days. I didn’t experienced bad days in the beginning but throughout the entire cleanse. I wasn’t getting enough food and my blood sugar level would go really low. I was doing only two shakes a day and then my chiropractor added a third shake along with 2 tablespoons of oil (I did coconut oil) which helped. When I would feel my body detoxing I would have to lay down and relax until it was gone which happened to me quite often! I didn’t venture too far away from home for the 21 days!!! I will continue with one shake a day along with veggies and fruits and add some protein. I wasn’t a meat eater before this but my chiropractor is (making?!!) me do some kind of organic meat whether it be chicken/beef. So we’ll see how that goes!!! Glad I found this blog! Lots of great comments and food ideas. I’m on Day 7, and with the exception of a minor headache on Day 3, I’m feeling pretty good. So far I’ve lost about 4 pounds. But the biggest improvement is that I actually slept all night last night — for the first time in a long time! Hopefully this cleanse will help with my bread / cheese cravings. My favorite snack consists of thin baked sweet potato chips and hummus. I’m learning to love sauteed veggies. I’m totally with you on the bread and cheese cravings. That is my weakness, but by the end of the cleanse I was over it. Thanks so much for your blog. I start SP today and have been searching the internet for inspiration, suggestions, recipes and helpful hints. I know it’s not going to be easy for me, since I lack self control (when it comes to eating and dieting) most of the time. 😉 I’m hoping I can stick with it and feel the great effects others have described. I haven’t been doing the powder + pills. Just healthy, clean eating according to this guide. Usually fruit for breakfast or a shake with some spinach (my Magic Bullet isn’t the best at grinding up the greens). Hopefully I see similar results but already feeling more alert + great. 6 days of no coffee (I’ve cheated a couple of times with half-caf), wine or cocktails is probably a record over the past couple of years! Yikes! Keep it up, Ashley! I can’t remember why I didn’t do quinoa the first time around. I just did my second cleanse and this time allowed quinoa. Try to do the powder and pills if you can. They are what will help fill you with greens, vitamins and minerals. Or if you must do the cleanse without it, be sure that you get plenty of food. You don’t want to starve your body. Good luck!! Ahh that makes sense. Quinoa is SO good for you! Question – did you do your SP cleanse via a Chiropractor? I’m thinking of doing the clenase. My chiropractor’s office supports SP and also asks that you have bloodwork done before and after. Did yours require that too? I did the cleanse through a chiropractor, yes. She’s a good friend of mine and was doing it at the same time so she ordered it for the both of us. I didn’t do any bloodwork before though. I suppose it’s always a good idea to check on your levels that way, although I don’t know if it’s necessary for the cleanse unless he/she wants to see how the cleanse changes levels in your body (like lowers cholesterol or something). I’d just talk to them about it. What kind of vegetable broth do you use for the lentil soup? Even the organic ones at the store have ingredients not on the approved list for sp. What are you seeing in the ingredient list? I used organic veggie broth. Of course, you could always make your own broth if you want. It has “natural flavoring” which is usually code for something not as healthy. I’m just going to use water, that should work fine. Also, thanks for the sweet potato fries recipe…it’s a life saver for a filling snack. Another good recipe I’ve come across is an Arabic dish called mujaddara. It’s just lentils, brown rice, water, olive oil, garlic, cumin, and sautéed onions. It makes for a great base to add steamed veggies! Natural flavoring is one of those tricky things. Usually companies put that because they don’t want to reveal their seasoning blend. Because it’s organic, however, you don’t have to worry about those natural flavorings being harmful or msg (which is what they are usually hiding). I did see a great recipe for homemade veggie broth yesterday. Just boil a blend of onions, carrots, garlic and celery in water and you’ll get some tasty broth! I am just wrapping up day two…feeling great! Organic green tea is highly recommended and really helped control my appetite today. I didn’t think it was on the approved list, but I received it as a recommendation in the daily purification emails they send out. I asked why and they said the amount of caffeine in organic green tea is trivial when compared with the health benefits. Good luck! My best advice…never let yourself get crazy hungry and plan meals that are more interesting than just salads. You can totally do this. How did you manage all the pill taking of the supplements? This is the hardest part for me as they seem to upset my stomach and give indigestion. I’m trying to focus on taking the cleanse pills and not taking all the fish oil and fiber – as of today since the cleanse capsules are supposed to be so good. I am on day four and not having too much of a problem with food since my stomach is always off due to supplement taking. I’m doing the cleanse to cut back on caffeine and alcohol which is tough but doable. I’m actually enjoying the cleanse with all the organic fruits and veggies as I usually don’t buy organic. Definitely will from now on!!! I hear you there! The hardest thing for me was the taste of the supplements. I already have a super hard time taking pills, so when they are stinky it makes it 10 times harder. I ended up having to take the supplements with a cup of very very diluted unfiltered apple juice (probably two or three times as much water as juice) just to get them down. I recommend taking the supplements on a full stomach so that it’s coated. It might help to have a bit of starch (sweet potatoes) or grain (quinoa or lentils even) to better coat your stomach at meals. I’d say the fiber is an important one to take as well…it’s fiber that will help flush things out of your system. Good luck! I have about 4 more days left on my cleanse… It has not been horrible I have been really creative and busy in the kitchen prepping food and cooking nightly. No that I am at the end I am struggling…… I cant not wait to go back to a normal diet. Do you know if you are able to eat eggs as a source of protein? Four more days! You can do it! That’s just awesome. I don’t know the official rule about eggs, but I know a lot of people who have eaten eggs for one of their lean protein sources. I say if it helps you make it through, then go ahead and eat eggs! I think that eggs add great variety. Just try to stick with organic free range. I was told you could eat eggs from the 11th day. I’m starting the SP cleanse this week. I just turned 40 and am making a huge effort to be as healthy as I can. I am glad I came across this it gave me the encouragement I needed. Thank you! Your story and cleanse is 90% the same as my story. I just stumbled across this post while looking for a food allergy I think I pin pointed. I have been going to a natural path for 8 months. I started going because of foggy thoughts. I told the ND that I wanted to do whatever I could do so I felt normal again soon. He put me on the candida diet. Very similar to your 21 day cleanse. I had done the candida diet 3 years earlier and it made me feel good then but didn’t break bad habits. I went back to my old ways. Your symptoms are almost exact as mine are. Like you wrote my story on your blog. My sons struggle with food allergies and that’s how and why we started going this route of natural health. I would love to chat. We should write a book about this. Honestly. Could you email me and I can give you my phone number? Hi Dustin! I’m so glad that my story felt so familiar! I became open to doing a cleanse after hearing such great things about them. The cleanse I wrote about here I did over 3 years ago so it’s actually all a bit foggy to me — not good enough to write about any more. But I totally encourage you to write about your experience if it was that eye-opening and helpful to you! I would have never imagined getting this many responses to my cleanse experience. Is it okay to oven roast your vegetables (and use oil) on days 1-10? I know the program prefers raw vegetables. But I was wondering what you did. It’s true, they do suggest eating mostly raw veggies, but if you’re anything like me, if you have to eat only raw veggies you won’t eat nearly as many. I’d try to eat a big green salad once every day, snack on raw veggies with guacamole and added spinach or kale to my smoothies. But I also roasted veggies in the oven or lightly sauteed them on the stovetop with coconut oil and maybe a tiny splash of high quality vinegar (my go-to vinegars are a white lemon balsamic and a fig balsamic from a local specialty oil and vinegar store). Using lemon juice and spices like garlic, oregano, basil, thyme and cumin also helped making the veggies more delicious. I’m contemplating doing this…..my only question is re: days 1-10….can you eat an unlimited amount of veggies and fruits? And, I’m uncertain how my tummy will respond to pills on just veggies and fruits. I’m thinking about starting Sunday. Also, assume no alcohol-at all? Hi Brenda! As far as I can remember you can do as many veggies as you want, but less fruits since they are full of sugar. And yes, no alcohol. I am on day 8. Thank you for your thoughts and recipes. I did a search because of a sudden headache and constipation that hit today. Strange. I can’t wait to try your lentil soup, though it’s July and might not fit my mood once I get it made in the next few days! I am on Day 4…and doing well so far..have already lost 4 pounds! Drinking gallons of water..eating vegies and fruits..esp honey crisp apples…I put half of a frozen banana in my shake twice daily and it helps with making it more frothy and creamy…The only detox symptoms I’ve had is super super fatigue..! So much so..I’ll just stop what I’m doing and go lie down for usually two hours..I know it is bec my body is detoxing and working so hard…I really look forward to my sautéed vegies and large organic green salad every day..not doing any rice or meats yet…love this SP lifestyle so far!